be fulfilled perfectly without delay. – you make a difference! 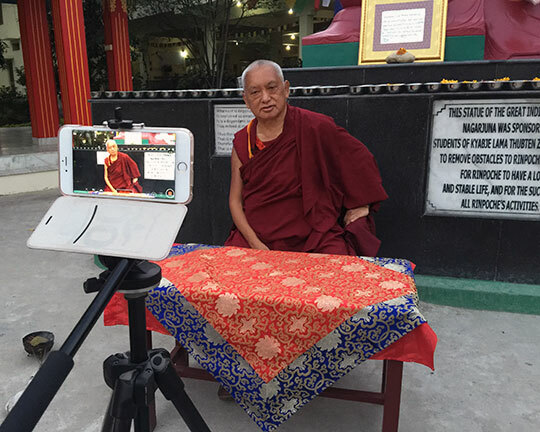 Video teachings of Rinpoche are available 24/7 via Rinpoche Available Now! Would You Help Us to Pacify Earthquakes? 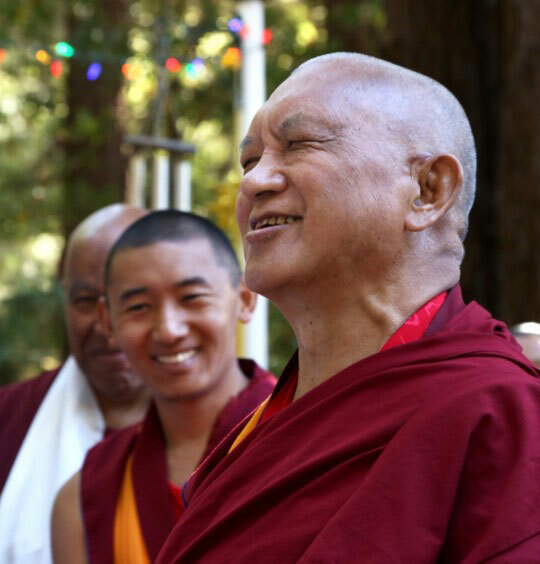 Lama Zopa Rinpoche, Vajrapani Institute, California, November 2015. 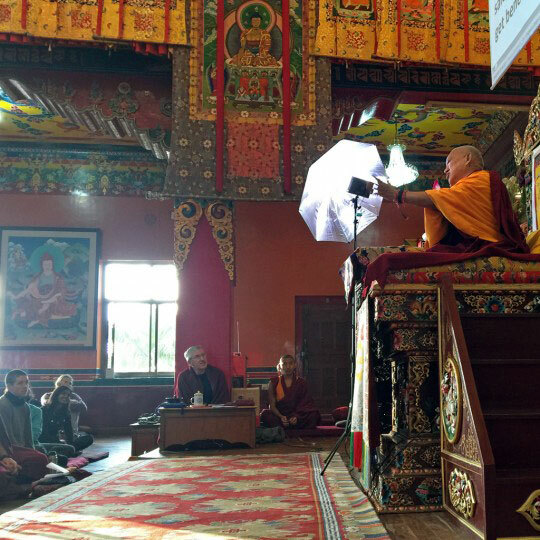 Lama Zopa Rinpoche teaching at the Kopan Course, Kopan Monastery, Nepal, December 2015. Keep up to date with Lama Zopa Rinpoche News. Find a wide range of advice from Lama Zopa Rinpoche on Rinpoche’s Advice page. 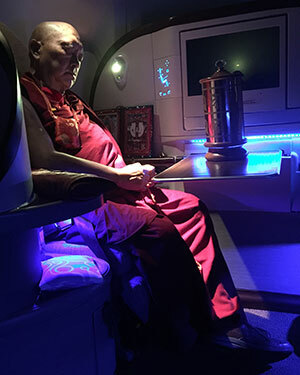 Lama Zopa Rinpoche making airline travel meaningful, November 2015. 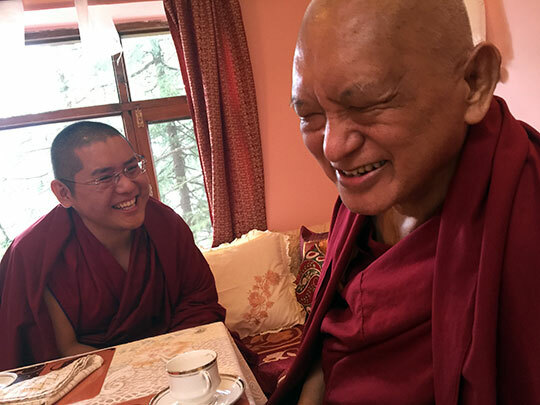 Lama Zopa Rinpoche with the abbot of Sera Je Monastery – neither wanting to sit on the higher seat – both wanting to sit on the lower seat, South India, December 2015. A new short film on the Sera Je Food Fund featuring Lama Zopa Rinpoche was recently released. In this video, Rinpoche speaks candidly on the importance of supporting the fund and the role it plays in spreading the Dharma in our world. Shots illustrating the logistics of preparing meals for all 2,500 resident monks appear throughout the interview. As the Sera Je Food Fund approaches its 25th year, we invite you to rejoice in the support it’s received and the impact the fund has had on the quality of life at Sera Je Monastery – all involved deserve tremendous thanks! In response to the advice from Lama Zopa Rinpoche that urgent practices need to be completed to help mitigate potential earthquakes in California, USA; Nepal; and around the world, we’ve made the recommended Kshitigarbha Practice available in a variety of formats. Mandala January-June 2016 is in the mail! This edition includes a new teaching from Lama Zopa Rinpoche; interviews with high lamas on the future of Gelug tradition; exciting updates on the Geshema degree and opportunities for Gelug nuns; an excerpt from FPMT-registered teacher Ven. René Feusi’s newest book; and more. We also invite you to peruse this issue’s online edition, featuring Piero Sirianni’s photos of Kopan’s nuns in action, an update from Kopan Monastery’s Helping Hands and other inspirational stories. A Mandala subscription is a benefit of the Friends of FPMT program. 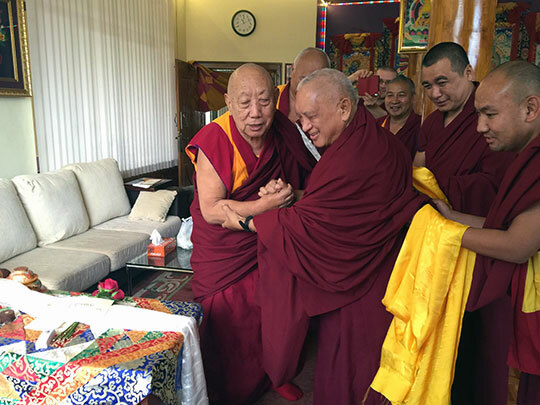 Lama Zopa Rinpoche with Ling Rinpoche, India, June 2015. The collection season for Merit Box has begun, and practitioners can turn in their accumulated offerings now until March 31, 2016. These offerings will fund the next batch of Merit Box grants, which will support of a variety of Dharma activities in 2016. Submit your offering today! If you would like to have a Merit Box for your home, you can order a free one here. We have plenty to share! This holiday season, check out FPMT Foundation Store’s end-of-year specials and give the gift of Dharma! 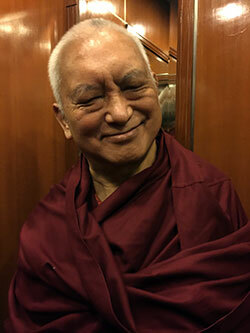 Lama Zopa Rinpoche, South India, December 2015. “What we have to always consider is that our organization has grown from hard work and sacrifice, and we have always had the burden of financial difficulties. Also, we all make mistakes. So often directors, having the burden and great responsibility of the center and its finances, sometimes have much worry and fear, and then they forget their practice. Then, the negative aspects come out and are stronger. We bring you a guide to some of the best technological aids for a variety of purposes, from accounting to volunteer management. We hope this guide can be of benefit for all FPMT center, projects, services and study groups and serve as a useful reference for you to improve efficiency and to lower costs. The Spanish translation of Chapter 4 of Gyaltsab Je’s Ornament Commentary is now available for both the Basic Program and Masters Program. This is a major achievement of Ven. Nerea and the Spanish Translation Office! The Basic Program final exam is available online in French. Thanks to Ven. Ngeunga of the French Translation Office! A new and revised edition of the “Masters Program Guidelines” and an extensive “Masters Program Materials Update” are available for those interested. Lama Zopa Rinpoche recently advised students to urgently do certain practices to help mitigate potential earthquakes in California, USA; Nepal; and around the world. According to Rinpoche’s observations, these practices should be completed by February 1, 2016. Accomplishing the advised numbers will take the quick mobilization of students internationally, especially to complete the recitations of the long Kshitigarbha mantra. Please join in as we come together to pray, recite, and practice for the benefit of all sentient beings. On January 1, 2016, following the Jangchup Lamrim teachings in South India, a long life puja will be offered to His Holiness. FPMT is delighted to be offering a range of ritual objects, including a silver Dharmachakra. You are very welcome to make a donation. Wisdom Publications is celebrating the imminent release of Rinpoche’s long-awaited book, How to Enjoy Death: Preparing to Meet Life’s Final Challenge without Fear. Pre-order now to help Wisdom keep the price of this beautiful special edition affordable, so that all can benefit from Rinpoche’s teachings. Chenrezig Institute, Australia is looking for an FPMT registered teacher to serve as their resident teacher; Chandrakirti Centre, New Zealand needs a new spiritual program coordinator; Tushita Meditation Centre, India needs an SPC/office assistant.